The new Fieldmaster-ED80DS is perfect for serious birdwatching and nature observations. This high-end instrument features a triplet objective lens providing a highly corrected image and overall excellent optical performance. Exotic ED (Extra-low dispersion) glass is employed in its construction which virtually eliminates chromatic aberation and delivers high-fidelity true-colour images. Optics are fully multi-coated throughout. Features a precision 10:1 ratio dual-speed focuser for exceptional focusing accuracy. Fully waterproof and nitrogen-filled for clear, fog-free viewing. 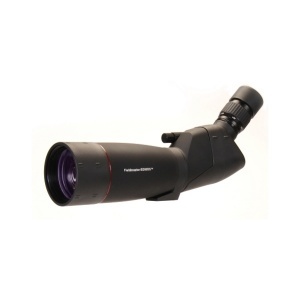 The supplied zoom eyepiece provides a generous 20-18mm of eye relief. Features a lightweight polycarbonate body with sliding dewshield/sun shade. Supplied with Stay-on case and tabletop tripod but can be used on a full-size tripod via its standard tripod bush.